Platelet Rich Plasma (PRP) / Stem Cell Prolotherapy is based on the same theory and methodology as dextrose Prolotherapy, however, the solution used is a high-density concentration of the patient’s circulating platelet levels isolated and concentrated by bidirectional centrifugation. Enhanced healing capability is possible when platelet concentrations are increased within injured or damaged tissue. For many years, the importance of platelets was thought to be formation of “plugs,” useful in reduction of bleeding in the tissues. It is now recognized that this may represent the least important function served by platelets. Platelets contain a significant number of key signal proteins, growth factors, chemokines, cytokines and other pro-inflammatory bioactive factors that initiate and regulate basic aspects of the inflammatory cascade resulting in natural wound healing. Elevated platelet concentrations are also known to stimulate the proliferation, differentiation and migration of needed mesenchymal and stromal repair cells to an injury site. Similar to dextrose Prolotherapy, addition of high-density PRP concentrates result in an inflammatory and proliferative response that enhances healing and promotes tissue regeneration. High-density platelet rich plasma (HD-PRP) is defined as autologous blood with concentrations of platelets at equal to or greater than four (4) times circulating baseline levels and which increases the important bioactive protein load (growth factors) in a direct correlative fashion. Cell ratios in average circulating whole blood contain only 6% platelets. In true high-density PRP preparations, the concentration achieved is 94%. The average patient platelet count is 250,000 platelets/dl. Four times this is 1 million platelets/dl, which is considered the desired benchmark for “therapeutic PRP.” The use of clinically proven devices to obtain this degree of concentration is considered essential to ensure platelet numbers and their important contents achieve therapeutic effects. Circulating platelets, when activated begin a degranulation process which secretes a variety of important growth factors and cytokines/chemokines, such as platelet-derived growth factor (PDGF: stimulates cell replication, angiogenesis), transforming growth factor beta-1 (TGF-B1):angiogenesis), vascular endothelial growth factor (VEGF: angiogenesis), fibroblast growth factor (FGF: proliferation of myoblasts and angiogenesis), and insulin-like growth factor-1 (IGF-1: mediates growth and repair of skeletal muscle), among others. Activated platelets also secrete stromal cell derived factor 1 alpha (SDF-la) which supports primary adhesion and migratin of mesenchymal adipose-stromal cells. (see figure 1). Various portable commercial centrifiguration units exist which process blood samples, resulting in platelet rich plasma concentrates. There are two commercially available systems which are capable of consistently concentrating platelets to the therapeutic levels. The one used for our investigation was the patented Harvest Technologies Smart PReP2 centrifugation system which has been cleared by the FDA. This system uses a sterilized blood collection kit which allows in-office phlebotomy and processing in a tabletop bidirectional centrifugation unit. The Harvest system is capable of consistently concentrating four to five times, or more, patient’s circulating level of platelets, therefore, achieving the needed therapeutic HD-PRP considered of most value. A concentrated growth factor environment, coupled with a living bioscaffolding, has been found to be important for Autologous Adipose (fat-derived) Stromal Cells (AD-SC) used in orthopaedic applications. High-density PRP (HD-PRP) has shown the ability to enhance musculoskeletal healing and stimulate local microenvironmental regenerative capabilities, especially during the early phase of tendon healing. Proliferation of AD-SC’s and their differentiation is also believed to be directly related to platelet concentration. 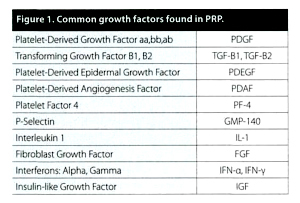 HD-PRP releases large quantities of Platelet Derived Growth Factor (PDGF), Transforming Growth Factor-Beta 1 (TGF-B1), and many others which, when activated, significantly enhance adipose-stromal cell proliferation and angiogenesis, as well as enhancing the survival of the fat scaffolding. The fat tissue complex used in this protocol provides a cell source and matrix (bioscaffolding) serving to provide improved adherence capabilities for proliferative stromal cell activity, which is then amplified with additional HD-PRP. Prolotherapy is the regenerative injection treatment that stimulates repair of a painful area of the body. Most notably it is used for arthritic joints (such as degenerative disc disease and knee osteoarthritis), sports injuries (such as a torn meniscus or rotator cuff injury), and chronic pain (such as from bunions and low back pain). The Prolotherapy solution starts with a dextrose base as the primary proliferant (Prolotherapy solution used for injection). The proliferant causes an inflammatory reaction at the injection site, triggering the healing cascade to regenerate and repair the damaged soft tissue. This proliferant works well in most cases, and sometimes minerals or fatty acids may be added to the Prolotherapy solution. In some more severe pain cases, especially with extensive cartilage damage, Biocellular Prolotherapy provides a stronger proliferant by using a person’s own adipose cells. One method of Biocellular Prolotherapy uses liposuction aspirates. These lipoaspirates are combined with platelet rich plasma (PRP) from a blood draw. This primary proliferant solution is injected into the damaged, painful joint. The ligament and tendon attachments of the joint are also treated with Hacket-Hemwall dextrose Prolotherapy. In our experience, where the Prolotherapy injections are given is also an important factor, not just what is injected. This means that Biocellular Prolotherapy includes not just a couple injections of Biocellular proliferants, but additionally, the whole joint/painful area is treated for underlying instability, which is likely the cause of the injury in the first place. If this aspect of the patient’s condition is not treated, we find that complete healing may not occur. Biocellular Prolotherapy is a type of autologous (from your own body), same-day lipoaspirate cell therapy. This means the collected adipose cells are put into a different part of the body in the same person during the same day procedure. Lipoaspirates are obtained from the abdomen or love handle area through a quick liposuction procedure. Liposuction takes 20-30 minutes, and the whole time in the office is an estimated 2 hours. Biocellular Prolotherapy is generally used in more severe cases, where a very strong proliferant may be a factor in speeding up the healing response more than expected with normal dextrose Prolotherapy. The main reason to use lipoaspirates as the proliferant in Prolotherapy is that adipose (fat) tissue contains an abundant population of adipose/stromal cells. Adipose cells are self-renewing cells in our bodies which repair and replace old/damaged cells. Injecting these cells directly into the damaged tissue has been shown to enhance the integrity of the tissue and reduce pain. In other words, lipoaspirates contain cells that have the potential to give rise to cells from multiple, but a limited number of, lineages. 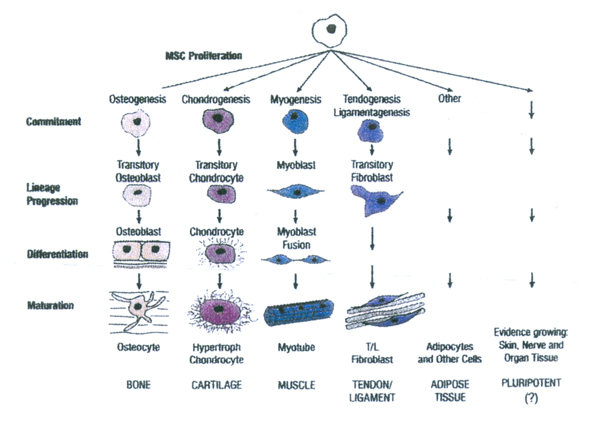 For instance, the adipose-derived mesenchymal cells can become fibroblasts (ligament and tendon cells), chondrocytes (cartilage cells) and fibrochondrocytes (meniscus and labrum cells) but they cannot become brain or nerve cells. How will you feel after Biocellular Prolotherapy? Just as with Hackett-Hemwall dextrose Prolotherapy, the treated area is typically stiff and swollen after the treatment, because the desired effect is a temporary, localized inflammation to stimulate blood blow and growth factors in the area. A patient can return to work the same or next day. Dr. Speciale will help individuals return to exercise within a couple of days, discussing possible modifications to encourage healing and minimize discomfort. The average number of treatments needed to achieve full healing is four to six, and each treatment is given four to eight weeks apart. Like all medical conditions and therapies, each person responds individually. At the initial visit, Dr. Speciale discusses how many treatments he feels will be needed to achieve the patient’s goals. An experienced Prolotherapy physician can give a reasonably accurate estimate. Because we see a lot of tough cases in our office who have failed numerous other treatments, sometimes it might be known upfront that Prolotherapy treatments could be needed for a full year or longer. Though this is rare, for a patient who is adamantly against surgery, or who has already failed surgeries, he or she may consider the time, energy, and money to use Biocellular Prolotherapy worthwhile.